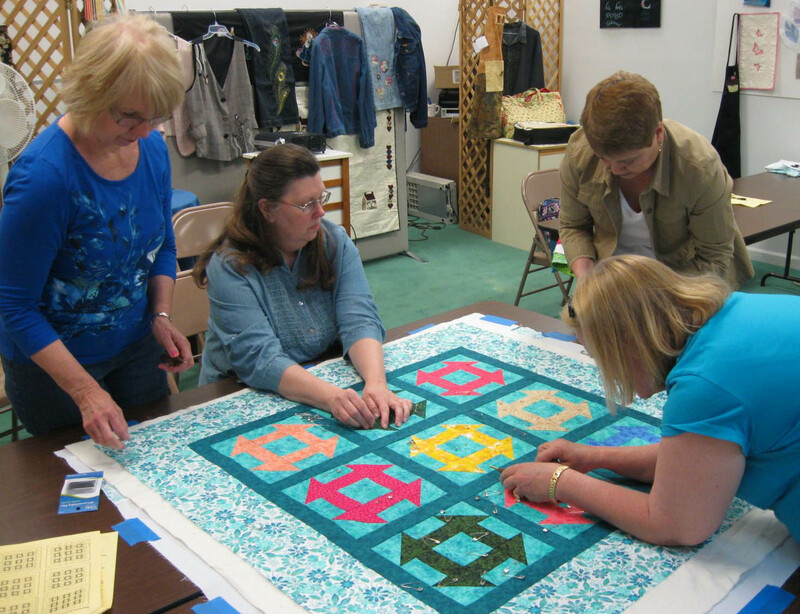 My students hit Week 4 of my Beginning Quilting class—basting the quilt in preparation for machine quilting. 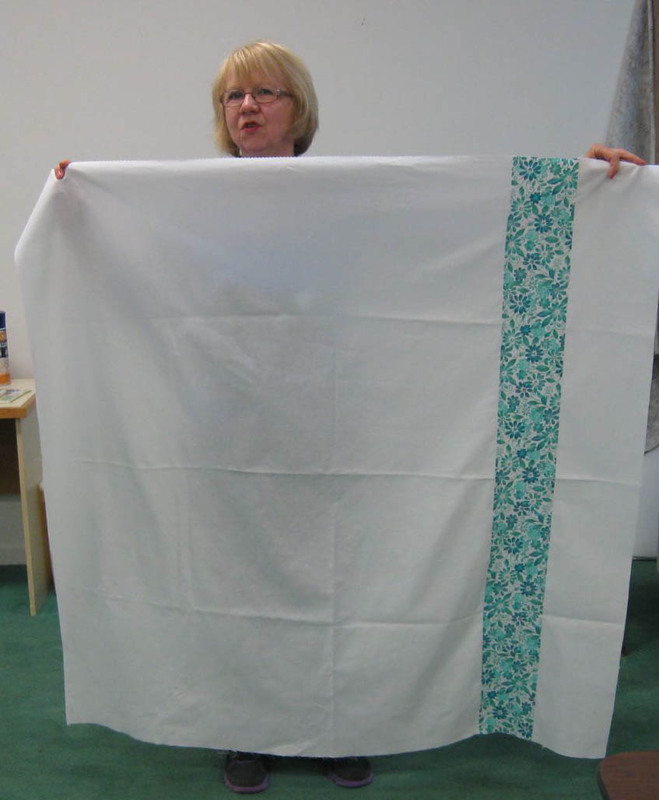 This is a fun week for me as quilt tops come together and we see final fabric choices for sashing, outside borders and backing. Here is today's Show and Tell. Don't you love the surprise on Louise's backing? 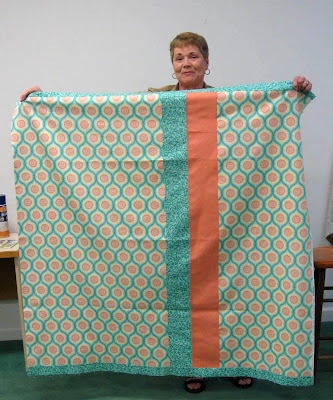 She unexpectedly found a coordinating print that was part of this fabric collection. The backing shows off the coordinating prints. Sue made her Churn Dash a scrappy version. 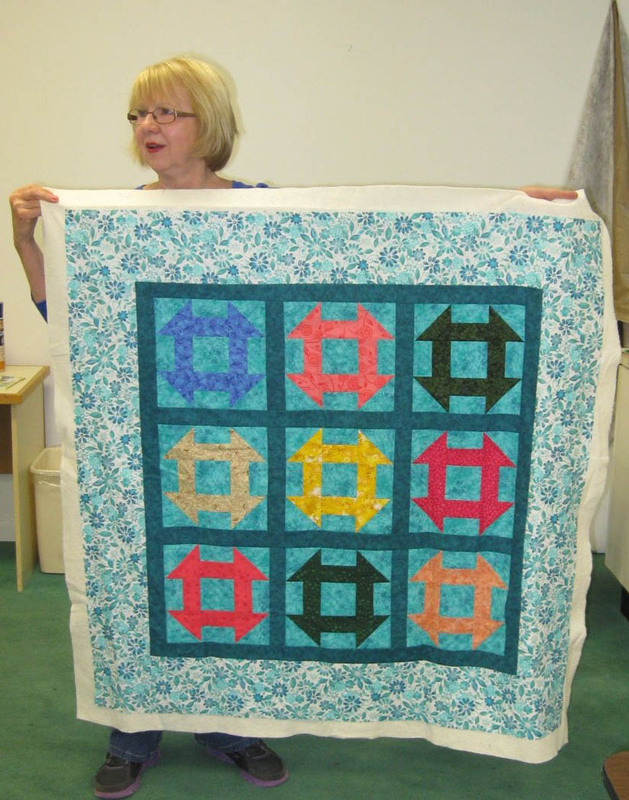 Last week, she auditioned the layout of the blocks and decided to put the bright yellow in the center. Your eye dances around the other blocks from color to color and value to value. Nice variety! 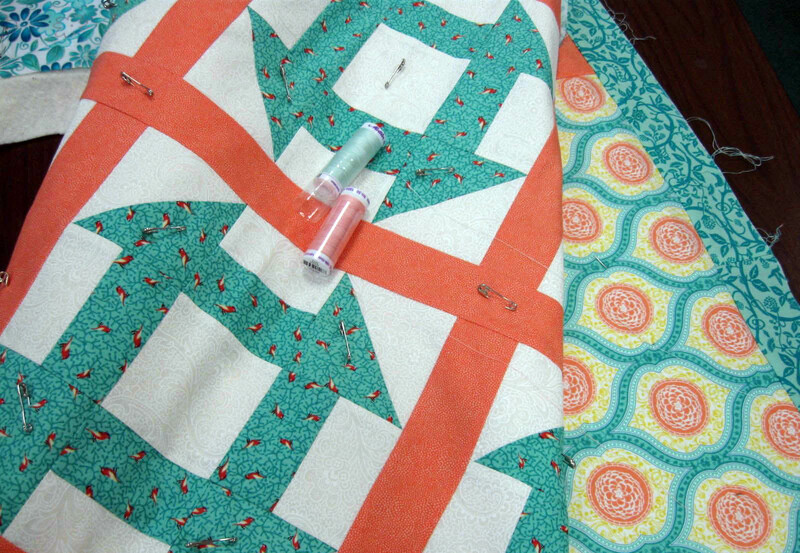 The background of the Churn Dash blocks is a Splash blender from Blank Quilting and the border is from the Inspiration collection. A light backing will show off the quilting. 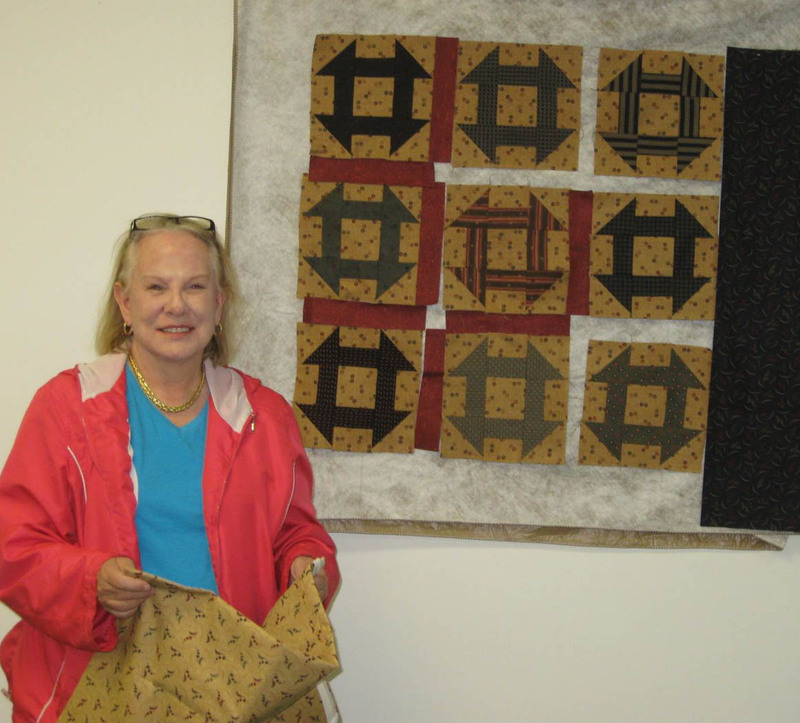 Sandra is making her Churn Dash for a grandson. 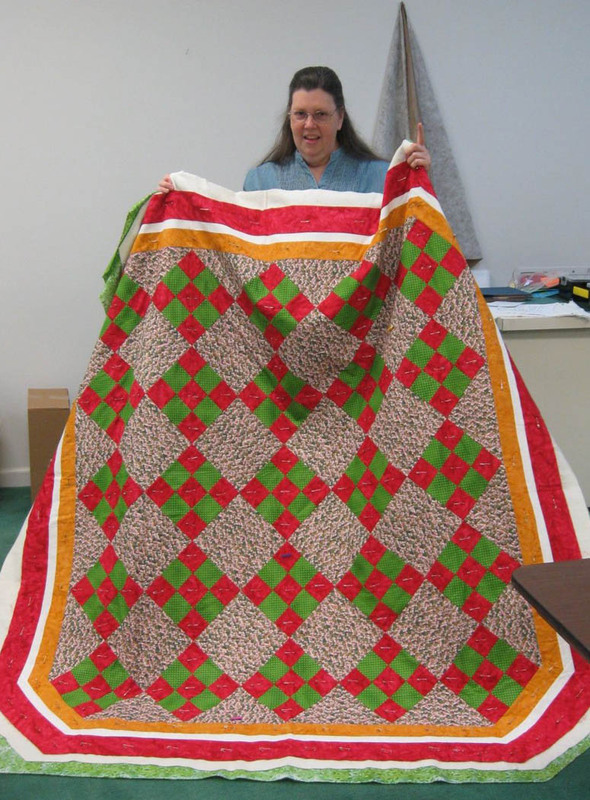 Her choice of colors, prints and stripes gives her quilt a masculine look. The dark border will frame it beautifully. Sandra's Churn Dash is for her grandson. Cheryl brought in this 9-patch on point quilt top. The color combination is striking! Everyone in class helps each other basting their quilt tops. With multiple pairs of hands, the basting process moves quickly. This is the best way to baste quilt tops (in my opinion)—with a bunch of quilting buddies! Group basting is the way to go! Auditioning thread color for quilting. 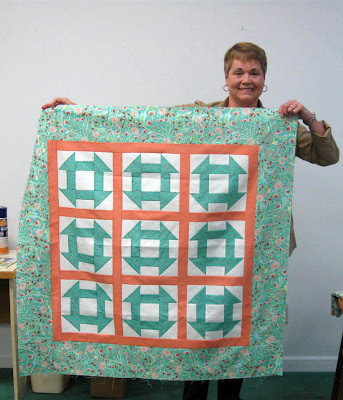 Which thread color do you think she went with—the peach or the mint? ?